Our Fringe Linen Collection incorporates all kitchen textiles a baker, chef, or host may need for their kitchen or dining room. Providing a selection of different colors, you are sure to find a color to match your décor. With quality in every thread these durable, long lasting kitchen textiles are a must with a timeless design that will make a statement all year long. Available in solid or checkered this look can go places and can easily be incorporated into many different styles for your home including farmhouse, relaxed and informal, timeless, or French country. Our table runners provide a great place to set down platters to prevent spills and scratches on your tabletop while adding style and flair. Available in two sizes these can be used on more than just the dining room table; place on entryway, foyer, console, or coffee table surfaces while still showing off the furniture. Set plants or other centerpieces atop the runner to update any space with a fresh new look. 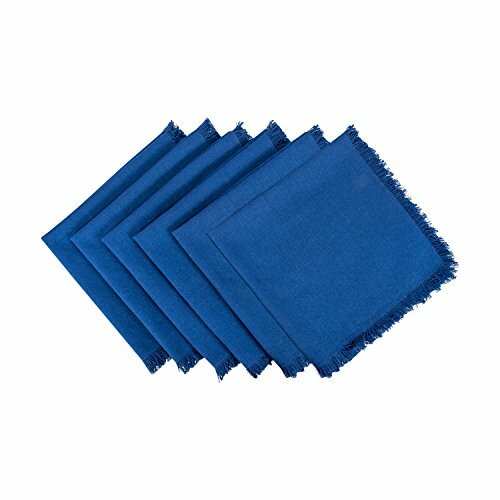 Have your dishes pop by using placemats as the backdrop, these generous sized 13x19” mats are made of 100% cotton with a 1” hem and decorative fringe for a casual, everyday look. Set a place for everyone, these placemats are sold as a set of 6, making a great choice to have on hand for large meals. To minimize shrinkage, please follow care instructions. Finish off your tabletop with matching napkins, made oversized to handle any meal no matter how messy. We make it simple to coordinate the perfect table setting, mix and match with our placemats and table runners to complete the look for your setting. All of these products are machine washable simply follow these care instructions: machine wash cold separately. To minimize the shrinkage, tumble dry low, remove just prior to being completely dry. Low iron if needed. TIMELESS CHECKER DESIGN - Fringed edges have a casual look that works with any style of dishes. Coordinate with matching placemats and table runners to create the perfect place setting. EASY TO CLEAN - Machine wash cold separately. To minimize the shrinkage, tumble dry low, remove just prior to being completely dry. Low iron if needed. HIGH QUALITY HEAVY WEIGHT 100% COTTON - Solid design will match to most kitchen décor. Makes a great hostess gift for Thanksgiving dinner or parties, give as a gift to cooking or baking lovers for Christmas, Mother's Day, birthdays, or housewarming. MORE OF DII PRODUCTS - DII offers delightful home products including charming napkin rings, placemats and tablecloths. To locate the matching napkin ring in the photo search - DII Napkin Ring Set.